Today's theme for Girls Talk is all about what's inside our wallets. Before I drone on and on about what's inside it, let me share first how I got it. I had this wallet last year when Hubby saw that I don't bring along with me any wallet and would ask him to place my debit card in his wallet when we go out. Poor me no? I am just too lazy to buy myself stuff. 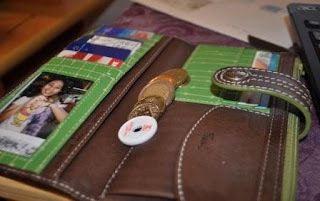 Since it was going to be Mother's Day soon, Hubby decided that we buy a wallet. And so there! So you ask, "What's inside my wallet?" Pretty much the usual stuff that one finds inside wallets: cards, bank notes or bills, coins and a photo or two. The photo I have in my wallet is a polaroid photo of me holding a tarsier. That was taken during our honeymoon in Bohol. I placed it inside my wallet to remind myself how small I was then. See the white plastic coin? I use that to insert in the grocery carts. Most grocery carts here are "coin operated". You can only use it if you insert €1 or €0,50 into the coin slot. You will be able to retrieve your money though after you shop and returned it to the cart park. I always run out of coins so that this white plastic coin always saves me the trouble of having to ask the cashier for some Wechselgeld (loose change). The cards in my wallet include my frequent flyer card, my and Samantha's health insurance cards, a credit card and three ATM/debit cards for Germany and Japan bank accounts. Currently, I only have 2 €5,00 bank notes in my wallet. Hehe! So how about you? What's inside your precious wallets? Share it with us this week on Girls Talk! sa bohol pala ang honemoon nyo? (naki chizmiz pa eh lol! )meron ding ganyan dito pero selective shops lang--tatanga-tanga nga ako nung una kasi di ko alam kung pano gamitin,di ko makuha ang cart lol! please stay tuned for the revelation on who will be the new host and the new home of GT starting july.. but I still will be joining GT so I shall not miss your post! Thanks for joining and for all your support at GT. Happy weekend girl!